With less than a week until opening, Milford’s latest restaurant, Ray’s Italian Kitchen reveals its team, set to make this place a huge success among locals and tourists. A familiar face known to many of us is James Jewell, who is taking on the role of Bar Manager, with his vast knowledge of wines and the ability to make a mean cocktail. 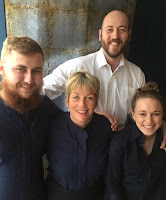 Joining James is 24-year-old, Star Lewis, previously at the Mill at Gordleton and the Royal Oak, Downton and Star will be responsible for the restaurant’s front of house operations. In the kitchen, Stacey will be taking centre stage and going back to her roots of cooking, with assistant chef, Ryan Light, also previously from the Mill at Gordleton.